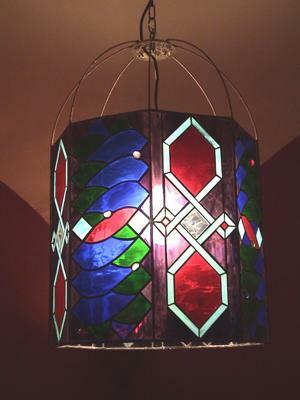 Please find attached 4 photographs of stained glass items. 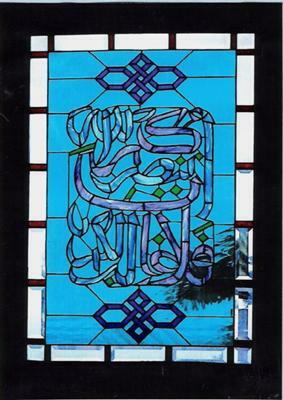 The second picture is a window, depicting an Arabic Prayer which was engraved on a small medallion. The window is about 50cm x 90cm. Forgive me if the calligraphy is not precise. The third picture is a window, about 50x50cm, inspired from a floor tile which I saw in the Museo de los Tiros, Granada. The fourth picture is of a mirror. 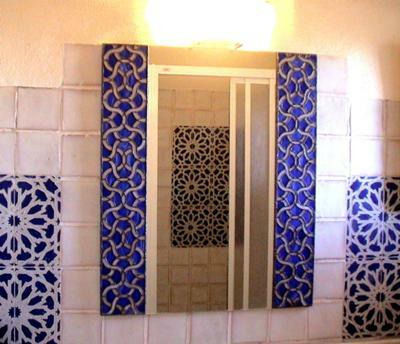 The border was inspired by a roof tile from Turkmenistan. I have been studying Islamic Art and Sacred Geometry for a few years now and find this subject totally fascinating in the way that it relates to the existence of all things in a cosmological way. It is my intention to spread this beautiful and awe-inspiring insight of the universe through my visual art of stained glass to all people around our small planet. Comments for Mr Peter Venning, designer and creator of Stained Glass. I`ve seen your homepage aswell, and I can see you`re good at what you`re doing! I tried to send an ordinary e-mail, but it didn`t work so I`ll try it from here. 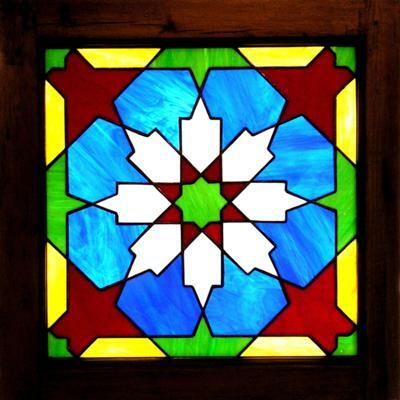 I was given the craft of stained glass in Israel eleven years ago, and it has stayed with me since. I`ve just finished my MA in Glass at the University of Sunderland and I`m longing for work with the stained glass, since I am well qualified. You also seem to share my fascination with arabic architecture!! My inspiration for my exam-piece "The eternal feminine" I took from the geometrical pattern of a muquarna dome at Natanz, in Iran, where the only shift in colour was the sun striking the 3-d surface in different ways. From Sweden -which also was my homecountry- I`ve got a degree in Glass-design from 2005. My exam piece there -"Tree of Life"- was a stained glass window with combined hot- and coldglass techniques, since this education was directed towards the hotglass industry of the Crystal Kingdom. However, I would LOVE TO WORK, even if it would mean only a couple of days a week I am a hard worker!! Can you help me with the opportunity (I could send you my CV, and recommendations from the glasscompanies where I`ve been working)? I also noticed you are multilingual, which suits me perfect (speaking swedish, english, spanish and a bit of german myself).